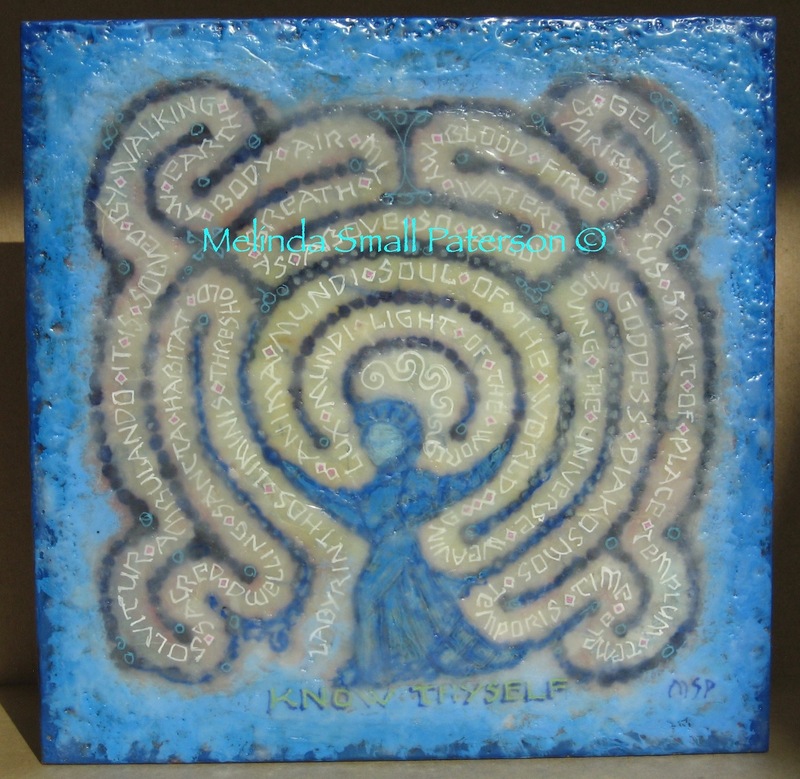 Ancient symbols from folklore and mythology are Melinda's sources for images and motifs. 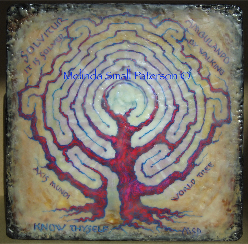 These paintings are her engagement with labyrinth themes, mixing textiles and fibers with encaustic. Encaustic is a paint made of melted beeswax mixed with damar tree resin and pigment that has been in use since ancient Greek and Egyptian times. The surface is malleable and fluid for only a moment until it cools, and then it can be carved or scraped. To bring the drawings into the wax, Melinda fuses layers of paper or fabric as undercoats with drawings in ink, charcoal or oil pastels. Labyrinthos is Greek from 'labrys,' the shape of the double axe, a door, and the butterfly, the shape made by the turns on the circle. A symbol of rebirth in use worldwide since 2000 BCE, it is the image of the ancient serpentine spiral dance, drawing the Chamber of Renewal. I find deep resonance to the image of the fairy castle of Celtic myth, Caer sidi, the revolving fortress, a place of action, gathering energy. The labyrinth in Welsh is CAER (hill) DROIA (to turn), "city of turns," the hill temple of refuge sanctuary. The mythical hero Theseus kills the Minotaur in the center, and is shown the way out by Ariadne¹s clew of golden thread, which tells us he was in a maze with dead ends. Today, labyritnths are defined as unicursal, having one winding way to the center and back. We can trust them, knowing we will not become lost. They are in focus now, in a wave of 'retronuevo,' the reclamation of the best qualities of the past and using them in a new manner to serve the present. "Everything the power of the world does is done in a circle." Each painting is wired on the back, ready to mount on a wall.